AMAZING VIEWS! PRIVATE! ROMANTIC! LOFT THEATER WITH GAMEROOM! NETFLIX! 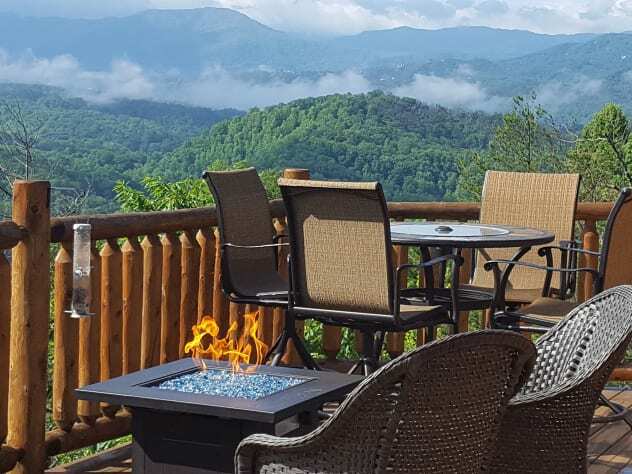 Majestic Mountain Memories offers an charming and private Smoky Mountain escape. 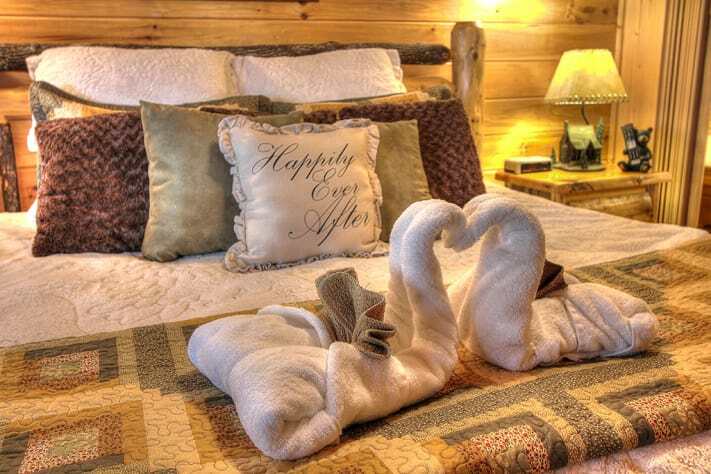 The peacefulness and solitude provide all the privacy you need for a perfect honeymoon, anniversary retreat, birthday gift to someone special or just a break from the stress of the real world. 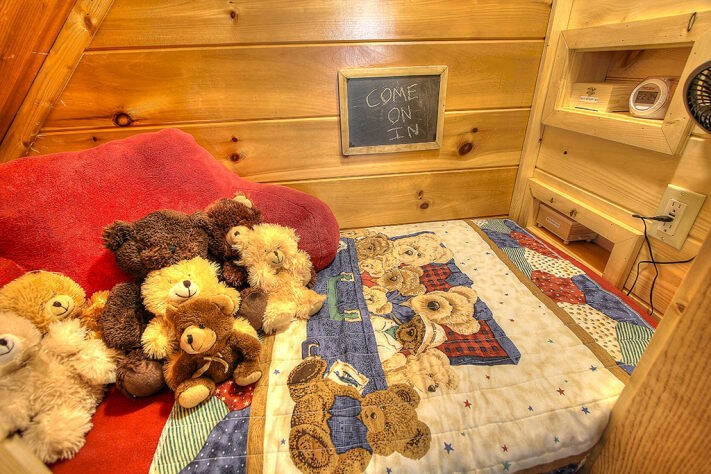 But it's not just a couples retreat--it is perfect for families getaways, too. We chose this location because of its solitude and convenience to all of the attractions, restaurants and shopping. 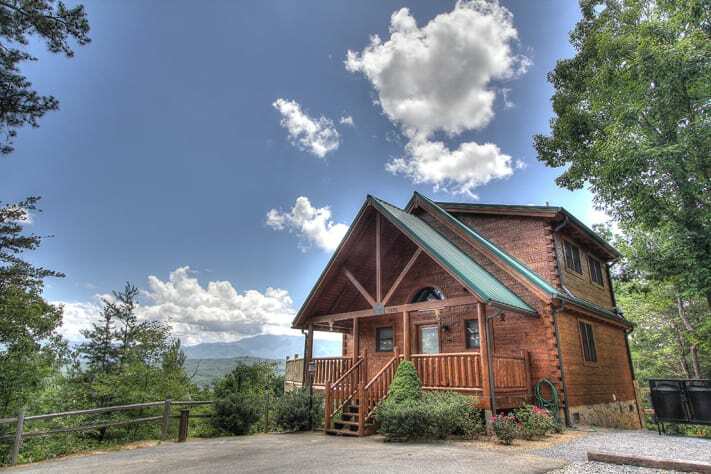 This two story custom built cabin has so much attention to detail you'll never want to leave and the mountain views will capture your heart! 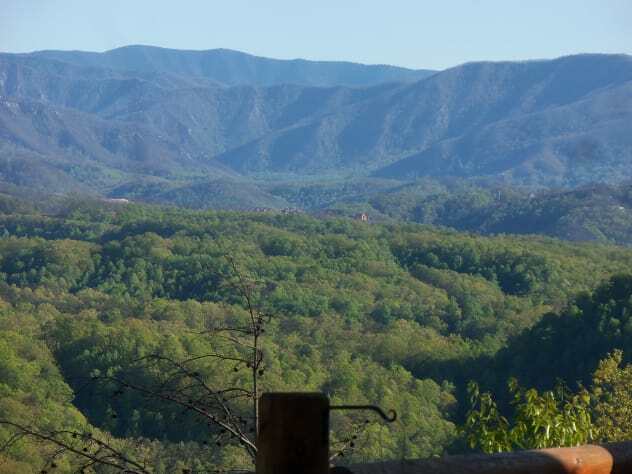 The cabin setting is quiet with the only noise being the Dollywood train whistle and local wildlife going about their day. 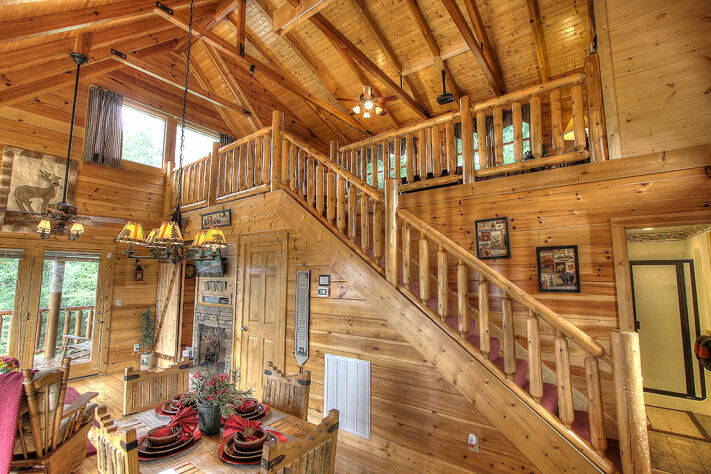 The cabin is surrounded by woods on all sides, except of course for the clearing of the view. This cabin does not sit on a cliff and there is plenty of space to walk around. It sits on a 1/2 acre lot giving the kids a chance to go outside and play. 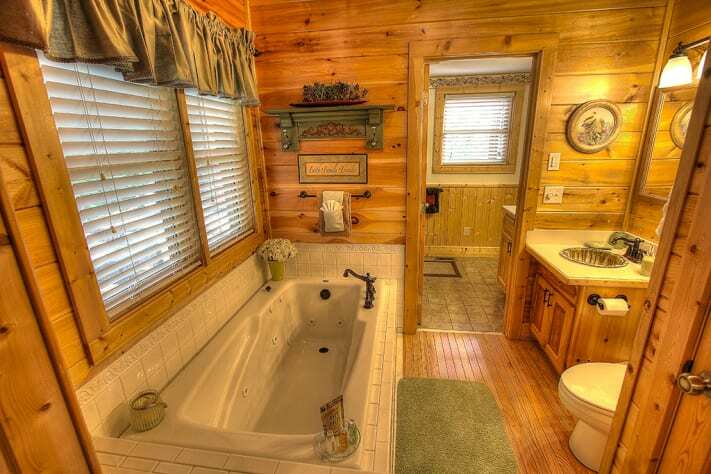 It is on a private cul-de-sac with very few other cabins. 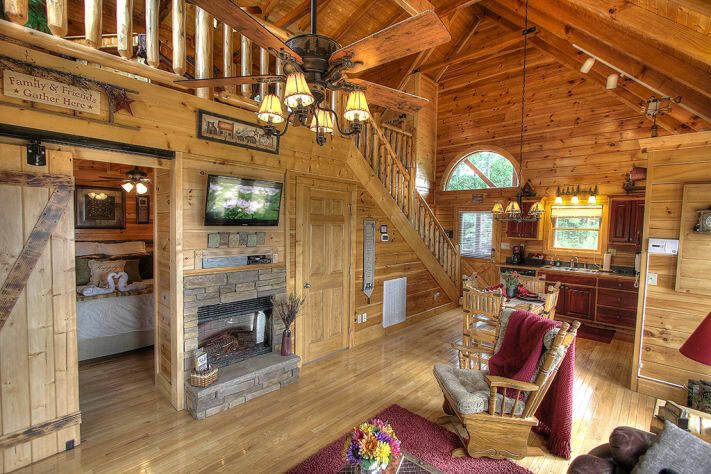 You avoid the feeling of being in a development with so many other cabins close together surrounding you. The only congestion you will find here is on the Parkway and we have many suggestions as an alternative. You have seclusion while still being in the middle of it all at the same time. 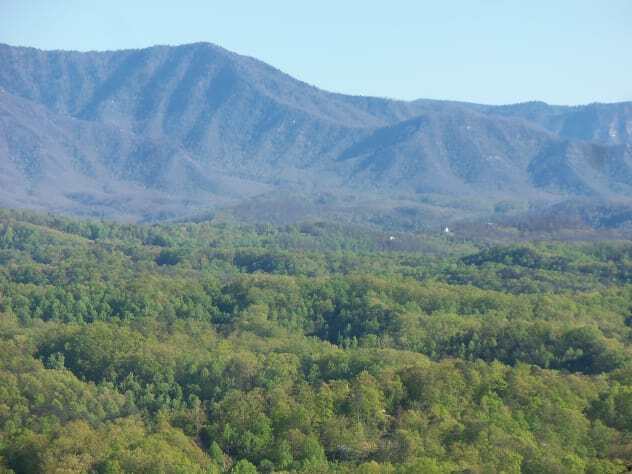 You come to get away and enjoy the mountains so why not with a little peace and solitude. The moment you arrive the memories will begin. 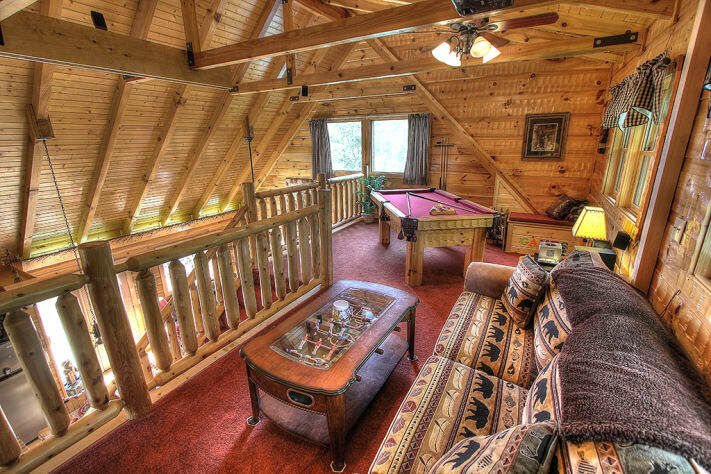 The cabin is loaded with all of the amenities for your enjoyment and entertainment. Relax in the living room on the leather sofa with two fold out recliners or the very comfortable rocker glider by the stacked stone fireplace while watching your favorite Netflix movie or DVD on the Flat Screen. 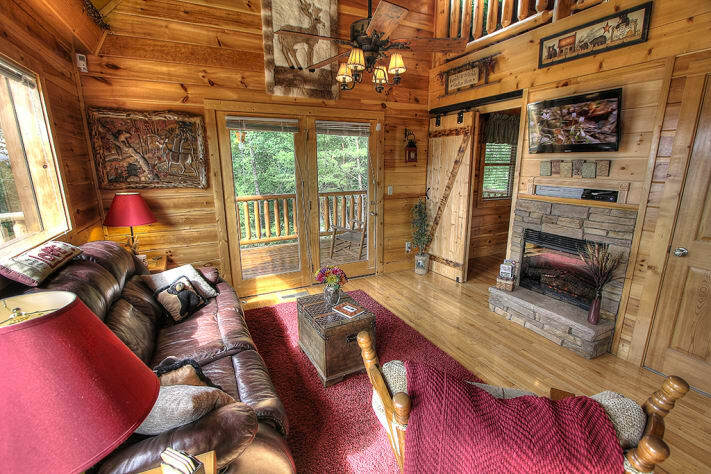 The main level Living Room has access to the back porch that is equipped with two rockers to rock your cares away as well as a two person jetted jacuzzi tub that faces the view of Mt. Le Conte. 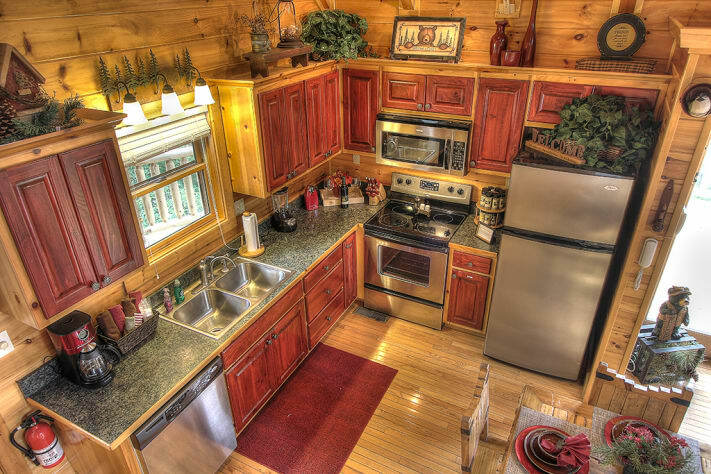 The main floor also has a full size kitchen with stainless appliances, nice dining area, and washer/dryer. 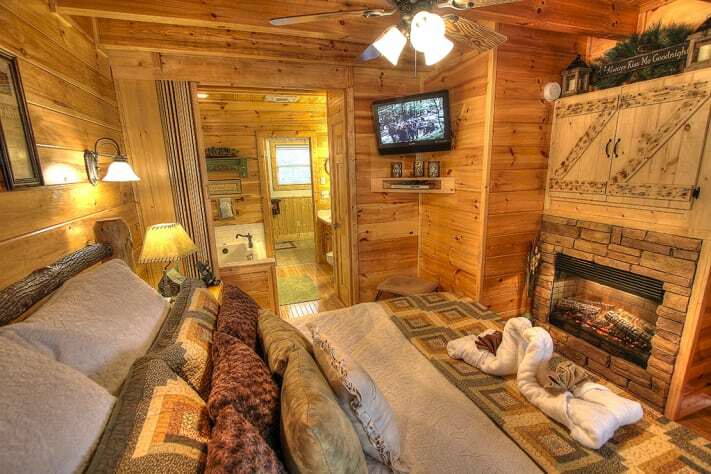 The Master Suite with king size bed, 32" flat Screen w/cable and DVD player, closet, and a full bath including a jetted hot tub. 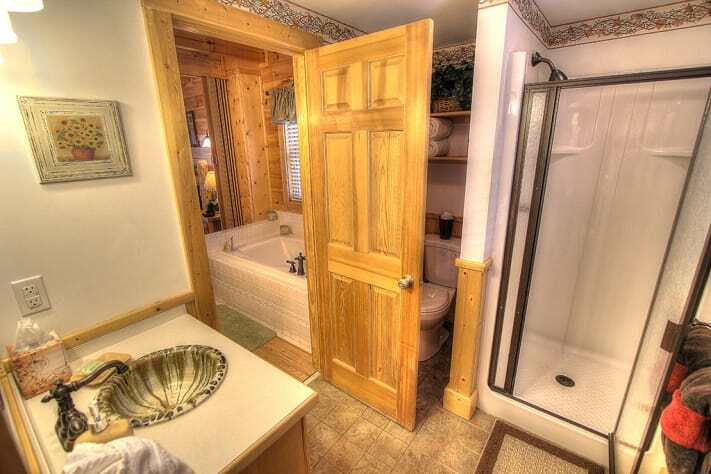 A second full size bathroom with shower is also accessible from the bedroom. The upstairs loft has a queen size sleeper sofa and very comfortable rocking chair. 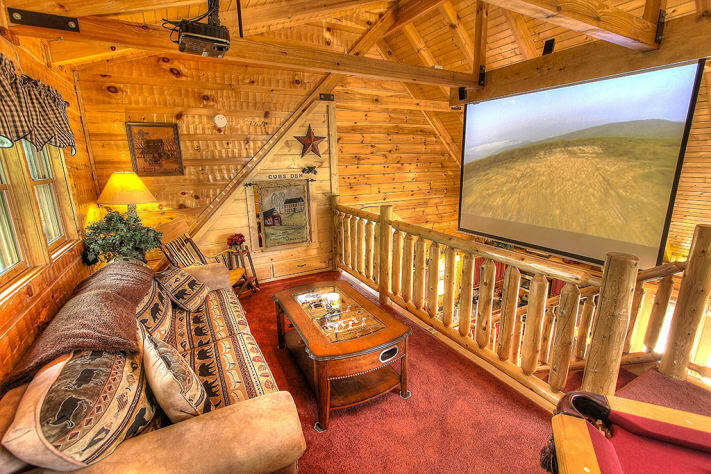 You can watch DVD's from our video library on the 100" Projector Screen with surround sound. If you have a competitive spirit you can challenge your family to a game of pool or foosball. If that is not enough you can pick up the pace playing a game cube video game on the video rocking chair. However if you just want to relax and have some fun with the entire family there are many board games. 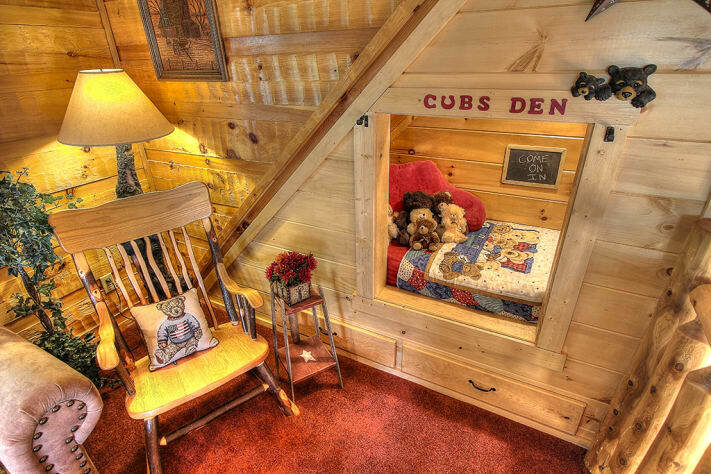 Our newest addition to the cabin can be found in the loft but I would keep the cub's den a surprise. 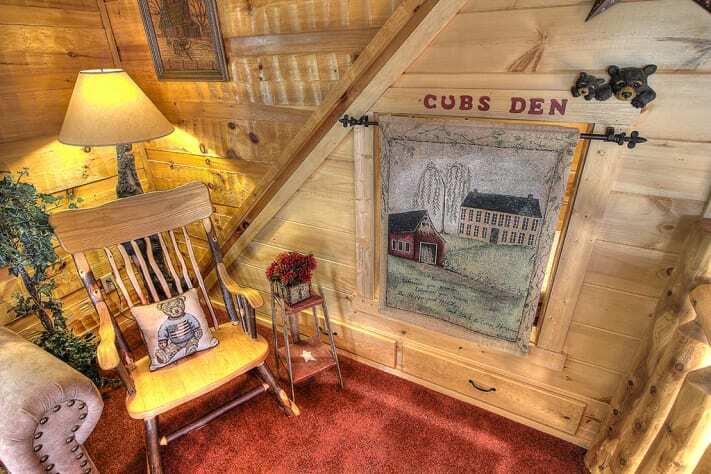 The cabin is equipped with a comcast high speed free WIFI system so bring your laptop. 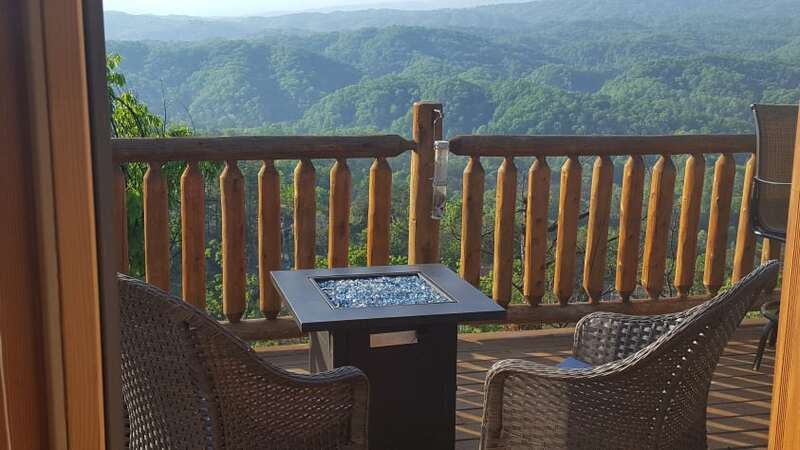 You can surf the net from the comfort of the back deck and watch the sun come up while drinking that first cup of coffee. 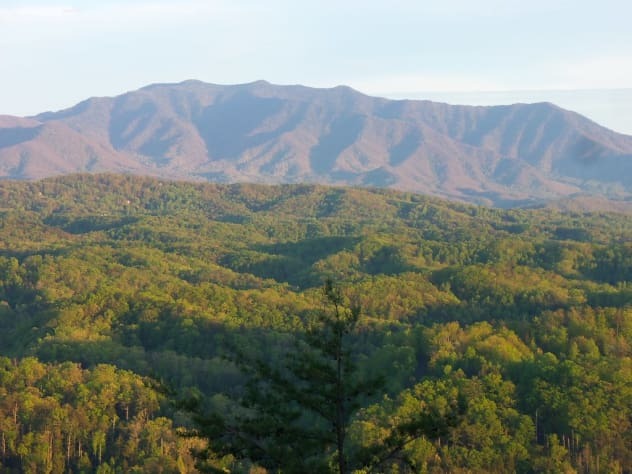 It is truly the perfect place to make life long memories, thus its name 'Majestic Mountain Memories'. The moment you arrive you know this is a special place. 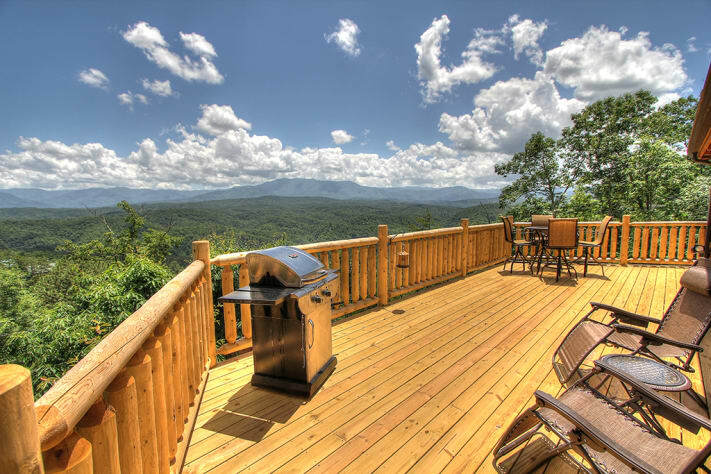 Whether you relax on the rockers, soak in the warm bath salt tub, snuggle by the fireplace, grill that perfect steak or just check out the ever changing view of the mountains as the sun sets. At the end the day, it is our desire in sharing our cabin that you put you feet up and recollect on all the memories you created that last a lifetime. 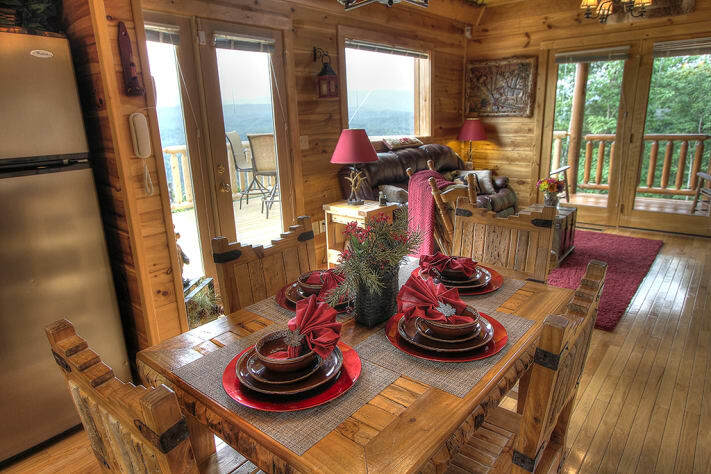 Best cabin in Sevierville! Beautiful view and private! This place was beautiful! 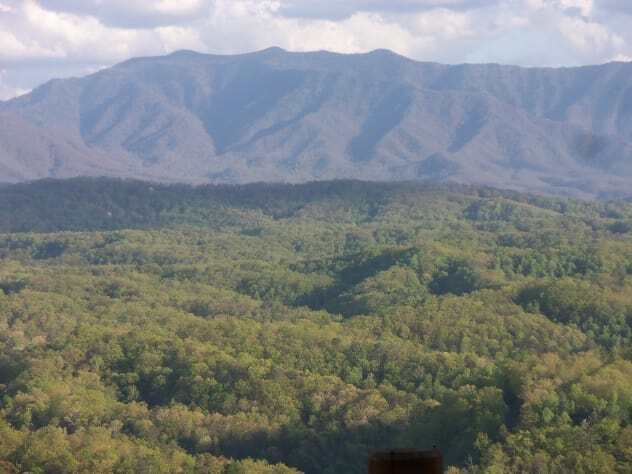 It is in a secluded area, almost on the very top of a mountain. They are building a couple cabins near it, but doesn't look like it will be done anytime soon. 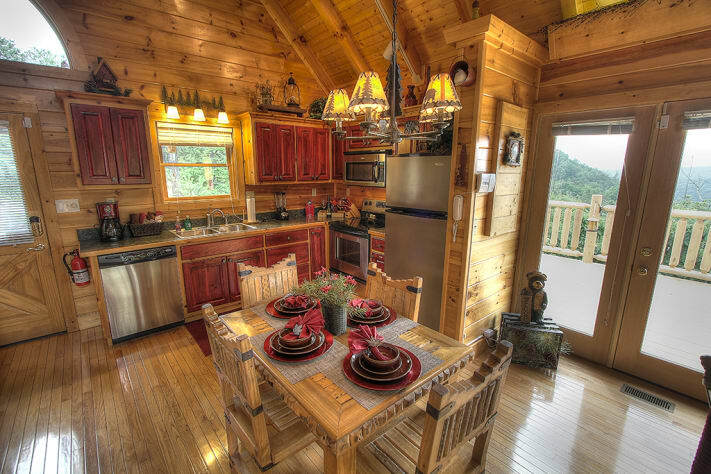 The cabin is perfect size for 2 people. Everything worked. 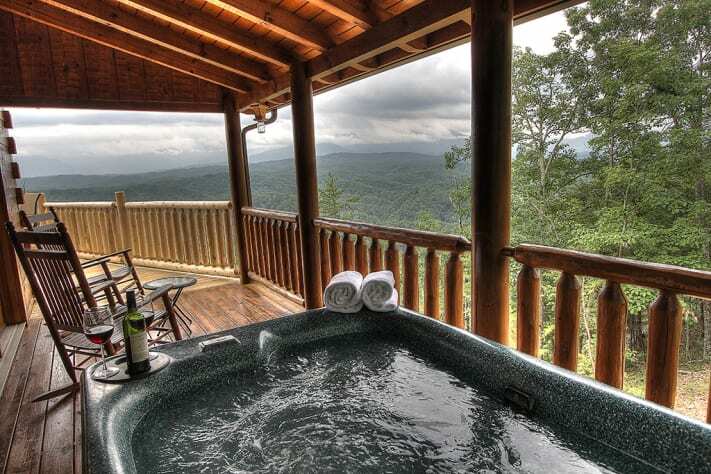 You have your own hottub that is also private, and still looking perfectly at the beautiful view. You even have your own outside fire pit area. My husband and I loved it and will definitely be going back! The owner is very nice too!